Whether you’re adding to patio furniture you already have or starting from scratch, I have a few key pieces that I would consider essentials. Well guys, we’ve had two days of decently warm weather and I’m already ready to start talking about outdoor décor! We’re only 6 weeks away from Derby, which pretty much kicks off the outdoor entertaining season so you might as well start planning now. Whether you’re adding to patio furniture you already have or starting from scratch, I have a few key pieces that I would consider essentials. Lounge Seating. Regardless of what your personal design style is, you’re going to want some comfy seating options. Whether you have a whole crew of people over for a party or you’re just enjoying your morning cup of coffee on the patio alone, having a relaxing place to lounge will make you actually enjoy spending your time outdoors. I encourage you to try a variety of pieces; a sectional and a couple of chairs, a pair of loveseats and an ottoman, a sofa with a loveseat and swivel chair. The options really are endless, so pick out something that works for your space and your lifestyle. If you invest in some quality outdoor furniture in a neutral fabric, it will last you for years and years. If your furniture will be in a LOT of sunlight, avoid super dark colors or you’ll have issues with fading. You can change things up each year by buying new outdoor throw pillows or a new outdoor area rug. Since you know you won’t get tired of the designs after one season you might as well try something fun and bold! Outdoor Dining. An outdoor dining area is a must for entertaining al fresco. You can host a seated dinner party or pull aside the dining chairs and just use the dining table as a serving buffet. If you buy a dining set that seats 6-8 then you can accommodate a decent sized group of people, but also use it on a daily basis without feeling like you and your spouse are sitting at a giant table all alone. Plants. Duh. I don’t mean to state the obvious here, but you could have the most gorgeous patio set in the world, but if you have dead grass right next to you, the impact won’t be nearly as dramatic. We don’t all need to be Martha Stewart, just be honest with yourself about your gardening skills and your level of commitment to your yard. If you want to go all out and have a formal garden with manicured topiaries and cobbled pathways, I applaud you! You can also just try your hand at a couple hardy perennial plants in a complimentary color scheme. Just like interior design, it’s a good idea to play with the heights of your plants when planning out your landscape design. Plant some taller bushes towards the back of your flower beds and then scatter in some smaller flowering plants. Finish up with some low growing ground cover and you’ll have a well thought out and attractive landscape. Ambience. 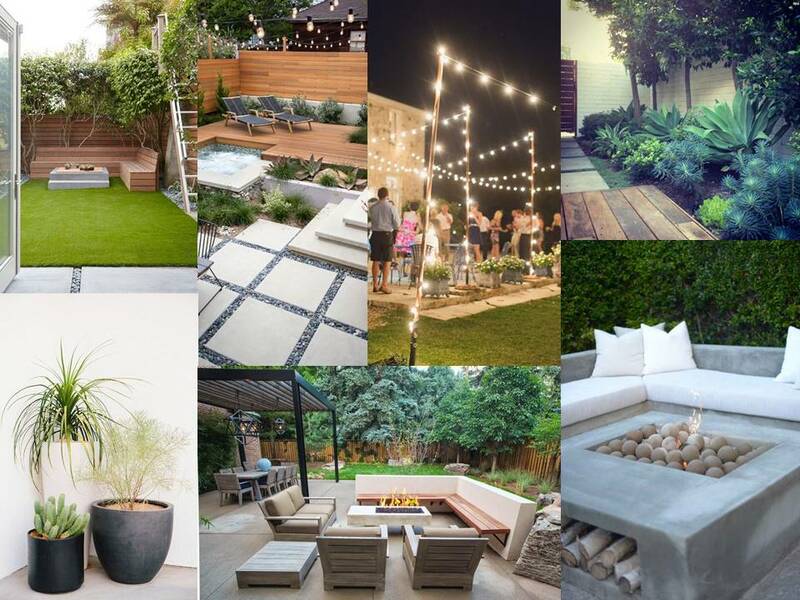 Take your outdoor space one step further by adding a little special “something something”. One of my favorite ways to do this is through lighting. There’s not much that’s more magical than spending time outside under strands of market lights. String some twinkle lights across your backyard to create the perfect atmosphere for any party, small gathering, or romantic night at home. I also love having a fire pit in your yard, whether it’s a large custom-built fire feature or just a small store-bought fire bowl. This creates a great gathering space and it, honestly, brings out the kid in all of us. Who doesn’t see a fire crackling away and immediately think of grabbing the ingredients to throw together some s’mores? ?